In order to achieve and maintain a beautiful lawn, employing basic lawn care practices such as properly mowing, fertilizing and watering are essential. It’s also important to ensure that nutrients can reach the soil beneath your grass. Aeration can be an extremely vital element to a healthy lawn because it allows air and water to penetrate built-up grass or lawn thatch. The goal of this article is to provide you with tips on how to seed and maintain your fescue lawn. 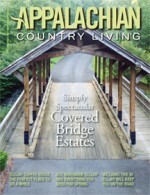 We’ve noticed that with the recent construction boom in the north Georgia mountains there is a growing number of people who desire a beautiful lawn. Many realize a green, healthy lawn provides both aesthetic and environmental benefits. Maintaining a healthy lawn has been challenging of late, due to severe drought conditions last year, unless you were fortunate to have an irrigation system. Even with an irrigation system watering restrictions can limit their use. However this year lawn care has had its own difficulties with excessive rain causing both weed and fungal issues. If you’ve experienced these setbacks, now is the time to take action. Our method to re-establish a fescue lawn is to core aerate and then over seed. There are numerous ways to aerate with different types of equipment. We’ve found aerators that pull plugs are the most effective. These types of aerators are generally found at most equipment rental shops. 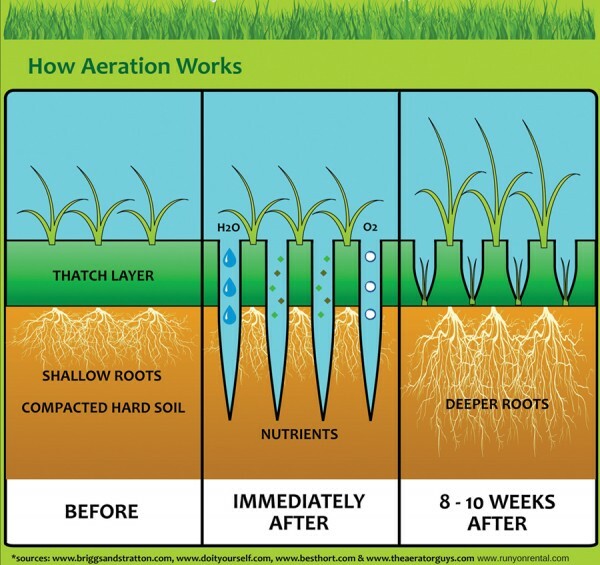 We use four steps in our aeration process. First, we flag the irrigation heads and other items in the lawn that need to be avoided. Second, we aerate. Third, we apply a three way blend of turf type fescue which is weed free. Lastly, starter fertilizer is applied to encourage seed germination and rooting. This sounds easier that it actually is. Aerating is exhausting and time consuming, but the benefits are worth it. When the grass seed enters the hole you’ve created in your lawn, the environment is perfect for germination. Seed makes contact with the soil and with some rain or supplemental water, you’ll have a thicker and healthier lawn within a couple weeks. Even if you’re not seeding your lawn, aeration is the most effective mechanical process one can do to achieve a hardy lawn. Aerating twice a year will get the best results. Starting when you first install your lawn. Very few people realize that aeration is preventative, rather than ‘repair’ after your lawn has weakened for become unhealthy. If you have not aerated regularly for several years, then we will recommend that you do so every 3-4 months for 2 years. You will notice the difference once you have been aerating regularly for a couple of years. Also, during aeration is when we can discover ailments. Anything from mold, mildew, bugs, disease, and anything causing your lawn the diminish. Aerating twice a year can save up to 30% of your water needs for your lawn, simply because your lawn will better distribute the water, and deeper into your soil. The best time for aeration is during the growing season, when the grass can heal and fill in any open areas after soil plugs are removed. Ideally, aerate the lawn with cool season grass in the early spring or fall and those with warm season grass in the late spring. Aeration is a beneficial practice toward achieving a beautiful lawn, but most people don’t realize it or understand the process. If your lawn is a candidate, make it an integral part of your lawn care regime. Your lawn will thank you for letting it breathe again.